As an intermediate guitarist it is likely you are wanting to know how to get to the next level. At this stage progress can often seem slow but the fact is if you are working on your skills they will improve. It's kind of like evolution. You don't notice it day by day but look back over time and its quite obvious. The focus therefore should be on developing your technique and this means putting yourself under the microscope. The 7 essential skills included in G4 GUITAR METHOD basically cover the most important areas that need constant focus if you hope to take your playing to the next level. These skills never change no matter what level you are at but where I find intermediate players getting stuck is often in the belief that they no longer need to work on these skills. E.g. Picking, rhythm, scales and so on. So perhaps its best if I explain how they apply to you. Picking technique in akin to a golfer’s swing or a swimmer’s stroke. Developing your picking technique should be ongoing. Check John Petrucci (Rock) or Frank Gambale (Jazz) for some examples of elite guitar pickers. These guys would spend time everyday just on picking technique. Chords Depending on the style you wish to pursue will depend on which chords are most important to you. With chords you want to be able to play them quickly but any new chord takes time to learn no matter what your level. If for example you want to pursue jazz then grab yourself a jazz chord book and aim at learning one or two new chords each week but don't rush. The goal should be quality rather than quantity. You should also back this up with a theoretical understanding of how chords are formed so ultimately you can work out any chord (as any good guitar player should be able to do). Devote some time each day to chord development. Scales Scale work will prepare you for learning songs, help you to learn the fret board, recognise patterns, develop your listening (aural) skills and build up finger strength and dexterity. Make sure you use a metronome to help develop evenness and to keep track of your progress. Also ensure you are doing sequences not just up and down the scale. Just ask your teacher for some scale sequence exercises. Rhythm/Strumming is a huge part of guitar playing. The guitar for many is almost a percussive instrument. In fact the guitar can be tuned in a multitude of ways to make chords simple and easy to play to allow the percussive guitarist to focus on the strumming hand. Strumming should be isolated. You can see this in Latin and Flamenco styles. Practice muting the strings first before attempting to play with chords. 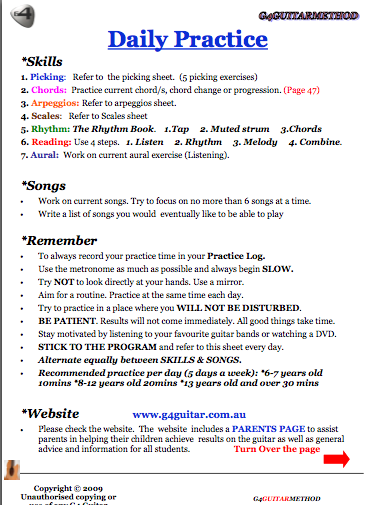 Use a metronome when learning new rhythms. Pay close attention to your strumming hand to ensure you are striking the right strings each time. 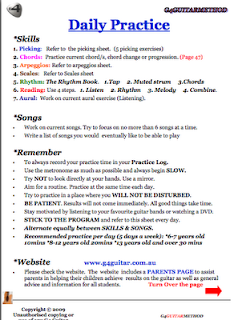 Try buying drumming or percussion books and work through the exercises. Reading is more than just looking at notes. Music is a language and the written note is like the written word. It is an important part of any language. I would say the written language of music is one of the most amazing systems ever created. It is probably easier than any spoken language yet extremely sophisticated. Being able to read music will allow you to gain a better understanding of many theoretical concepts such as harmonic and melodic structure, rhythm etc. I could write a book on the benefits of reading but we will leave that for another time. Grab a copy of the Real Book and see how many songs you can sight read. If you are new to reading you can download the reading material from our Student Site. For the intermediate reader try playing in different positions opposed to just one position. Aural refers to the listening side of music. In our case our ability to understand what we hear so we can transfer that knowledge on to the guitar. When you listen to music it should be like when you listen to someone speaking. You should be able to understand and even better recite back what you have heard. There is no greater gift for a musician than having a well trained ear. The good news is your ear can be trained at any age but usually the younger the better. You actually already have a certain amount of training but may not always aware of it.